Prepare soup according to package instructions. Assemble 2 sandwiches with 2 slices of cheese on each. Spread butter on outside of bread. Heat a skillet to medium heat. Place sandwiches in pan and cook for 3 minutes on each side. 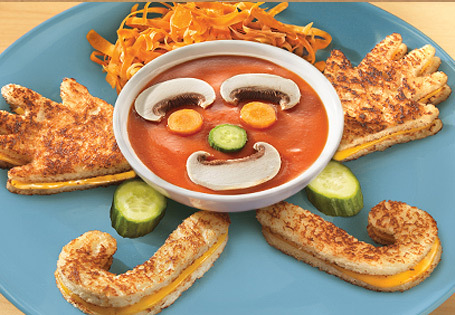 Using hand and foot cookie cutters, cut out shapes from the sandwiches and place on plate, leaving room in the middle for a soup bowl. Fill a small bowl with soup, place on plate. Decorate with cucumbers for ears and nose; this will be your "face". Shave carrot for wavy hair and cut two carrot slices for eyes. Cut mushroom in half and then slice for mouth and eyebrows.